Saw this amazing fact of banana peels on a facebook page. I've check about many benefts of banana skin but this is the 1st time I heard banana peel can whiten teeth. Can it really do so? Next time you want to throw banana skin away, think twice. See below story. Take a piece of the inside of the banana peel and gently rub around on your teeth for about 2 minutes. 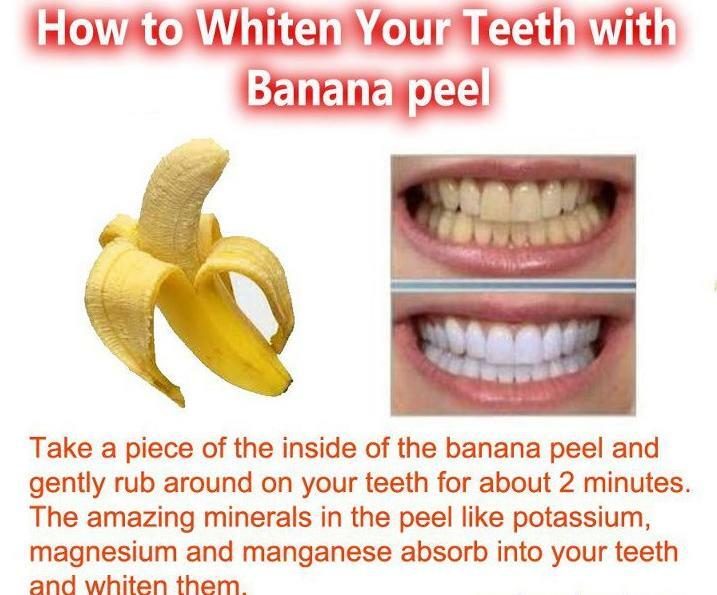 The amazing minerals in the peel like potassium, magnesium and manganese absorb into your teeth and whiten them. Banana peels are also rich sources of potassium and contain much more soluble and insoluble fiber than their flesh. Dietary fiber promotes digestion and bowel movements and can reduce blood cholesterol levels. Banana peels also contain tryptophan, which increases serotonin levels in the body and affects mood, much like the drug Prozac does. According to "Prescription for Nutritional Healing," researchers in Taiwan discovered banana peel extract can ease depression because of its effect on serotonin, which is a neurotransmitter in the brain responsible for balancing mood and emotions. Others found that eating two banana skins a day for three days increased blood serotonin levels by 16 percent. Further, banana skin contains lutein, a powerful antioxidant that protects the eye from free radicals and harmful frequencies of UV radiation from the sun. Lutein has been proven to reduce the risks of cataracts and macular degeneration, as cited in "Biochemical, Physiological and Molecular Aspects of Human Nutrition."